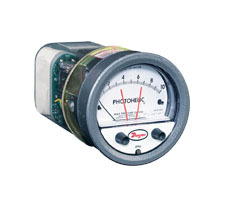 The Photohelic® Pressure Switch/Gages On-Demand Cleaning Controller provides a simple, complete dust collection control all in one enclosure. 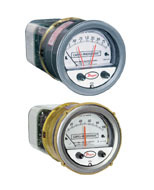 The Photohelic® controller combined with the DCT500DC Timer Control provides a timed energization of solenoid valves when the differential pressure indicates filter cleaning is necessary. The operator can easily set the cleaning initiation and duration by adjusting the 2 set point knobs on the front face of the Photohelic® controller. Solenoid valve sequencing is also easily set via two potentiometers inside the enclosure on the timer board. A three position switch on the front of the enclosure offers cleaning versatility by allowing the user to select between on demand or continuous manual cleaning. The Photohelic® controller is pneumatically connected with tubing to fittings on the enclosure. All that is required for start-up is connection of tubing from the process to the external fittings on the enclosure, and wiring the solenoid valves to the timer board. Output Channels: 4, 6, & 10 channels. Power Requirements: 10 to 35 VDC, 0.6 watt max. no load power. 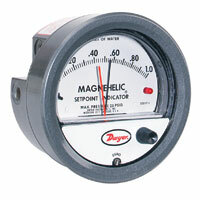 120 Volt powered timer board also available. Solenoid Supply: 3A max. per channel. Fuse: Type 3 AG, 3A @ 250 VAC. Storage Temperature Limits: -40 to 176°F (-40 to 80°C). On Time: 50 msec to 500 msec. On Time Accuracy: ±5% of setting. Off Time: 1 second to 200 seconds. Off Time Accuracy: ±5% of setting. Accuracy: ±2% of full scale. Pressure Limits: -20" Hg to 25 psig (-0.677 bar to 1.72 bar). MP option: 35 psig (2.41 bar); HP option: 80 psig (5.52 bar). Process Connections: 1/8" female NPT (duplicated side and back). Size: 4" (101.6 mm) dial face, 5" (127 mm) O.D. x 3-1/8" (79.38 mm). Weight: 1.8 lb (816 g). Switch Type: Each setpoint has a 1 Form C relay (SPDT). Relay Contacts: (resistive load) 1 Form C rated 1.0A @ 30 VDC, 0.3A @ 110 VDC or 0.5A @ 125 VAC. Gold over clad silver - suitable for dry circuits. Electrical Connections: 18" (46 cm) cable assembly with 8 conductors. Optional lengths to 100' (30.5 m). Power Requirements: 24 VDC, regulated ±10%. 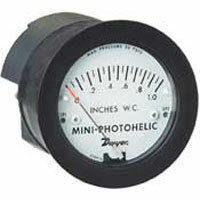 External, manual adjustment of set points with Photohelic® controller adjustment knobs. On and off time easily set with 2 potentiometers located on the DCT500DC timer board. 3 position switch for selecting between On-Demand Cleaning or continuous manual cleaning. Photohelic® controller pre-connected with tubing to pressure fittings on body of enclosure. 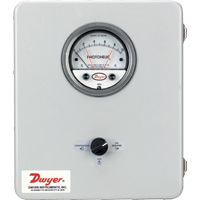 EXAMPLE DCTE504A 3000MR-0 AT Series DCTE504A-3000MR-0-AT Photohelic® Pressure Switch/Gage On-Demand Cleaning Controller, range 0-0.5" w.c., 4 channels, with aluminum tag.